Be the first to share your favorite memory, photo or story of Colonel Marvin. This memorial page is dedicated for family, friends and future generations to celebrate the life of their loved one. Marvin was a decorated USAF veteran who served with honor. He enjoyed teaching and refereeing soccer and was one of the founders of Fort Crook chapter IPMS. Marvin was preceded in death by his parents and son, Bryan Howell. He is survived by his beloved wife of 59 years, Anita Howell; sons, Damon (Amber) Howell and Matthew (Tamma) Howell; grandchildren, Matthew, Reed, Audrey, and Lauren and extended family members. To send flowers or a remembrance gift to the family of Colonel Marvin W. Howell, USAF (Ret), please visit our Tribute Store. 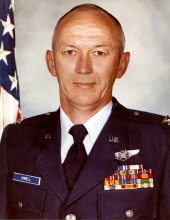 "Email Address" would like to share the life celebration of Colonel Marvin W. Howell, USAF (Ret). Click on the "link" to go to share a favorite memory or leave a condolence message for the family.